Age: It went live on September 3rd 1998, making it over 19 years, 7 months old. 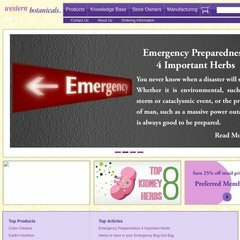 westernbotanicals.com Western Botanicals - Herbal Products - Organic and Wildcrafted ..
On average 6.00 pages are viewed each, by the estimated 117 daily visitors. American Registry For Internet Numbers (Virginia, Chantilly) is the location of the Apache/2 server. Westernbotanicals.com's server IP number is 74.122.152.241. cf.marketrends.net, and svr2.marketrends.net are its DNS Nameservers. PING www. (74.122.152.241) 56(84) bytes of data. A ping speed test response, is timed at 55.2 ms.